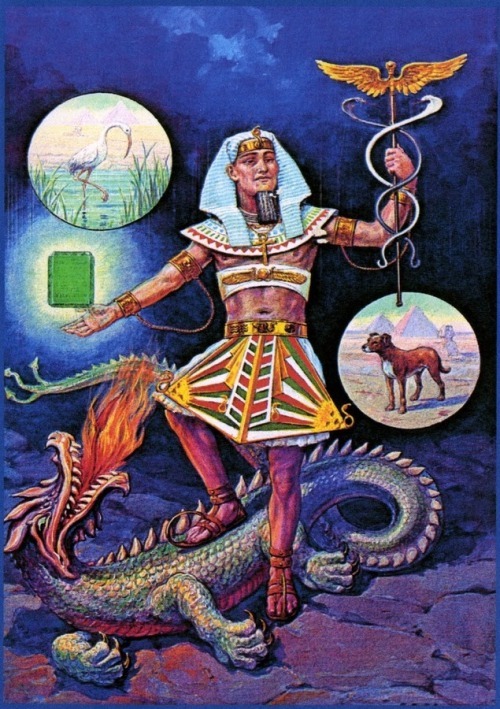 Hermeticism or the Western Hermetic Tradition is a set of philosophical and religious beliefs or gnosis based primarily upon the Hellenistic Egyptian pseudepigraphical writings attributed to Hermes Trismegistus who is the representation of the conflation of the Egyptian god Thoth with the Greek Hermes. These beliefs have heavily influenced the Western Esoteric Tradition and were considered to be of great importance during the Renaissance. You need to be a Seeker of Hermetic Teachings to add comments! Kim Thank so very much for the link you provided to David Metcalf's post on Music.....and the Skull!!! - I not only read the article which holds an important key to add to the research I have been doing but found a link to read his other inspiring posts! What a great find as is this Group! You own nothing! There is nothing anywhere that is not borrowed, is not a gift loaned to you for the development within yourself of purpose. “Purpose” for the discovery of your SELF, your Identity, the reason for life and the processing of your consciousness and your body to handle this powerful life changing knowledge. Ability to handle this TRUTH. Wow! So all “matter” is a gift on loan and you have a chance to decipher the code(x) and find out WHO YOU REALLY ARE. There are trails and hills and dales and ups and downs and merry-go-rounds and dizzy mazes until some realization comes to you. A recognition of circumstances and their patterns and how it relates to you and to who you are. The Doctrine states ;” Every good gift and every perfect gift is from above, and cometh down from the Father of light, with whom is no variableness, neither shadow of turning. The Immortal , Eternal, Immutable, Divine Being Mind within which we live and have our Being and whose Beingness is within us, is a wholeness inseparable of no form and therefore no shadow. This state is dynamic, there is no stasis here. Everything there is, is a gift. Everything, every gift is from above. We mean High Plane. We mean that you are potentially there, for although you are “here” (Earth Plane), you are also there now (most likely without your awareness)...not ready to know. Some part/body/vehicle that is you on another plane is waiting for your arising consciousness. *ALL IS ALL. DESERVE YOUR SELF. Responsibility and Balance are necessary for reconciliation of the Self. Self Knowing is a richness and the Way To Go. This is possible . It can be done. It has been done. You can even take it a step further. When you redeem your SELF, you redeem ALL. You become the greatest gift giver. You become the Light held out to Mankind. You incorporate THE CHRIST WITHIN to Become that Being! THERE IS SOMETHING YOU HAVE TO KNOW. THIS IS REAL! THINK! THERE IS ONLY ONE. IT IS YOU. THAT MAKES YOU THE PROPHET, THE MESSIAH, GOD! You are in the MIND OF GOD. GOD IS WITHIN YOU .YOU ARE ALL THERE IS IN POTENTIAL. This makes development so important. Think! You were put here to “awaken” and effect a transmutation of the consciousness to return to THAT STATE OF CONSCIOUSNESS where you know Who You Are and have become that BEING! Talking about Christ as if He were outside of your self puts off the responsibility that you have to be Christ. After all, there is only ONE and you are in the Mind of God (by any name) and He/She is within you helping you to help yourself to process to your inherent Identity. Do we understand what History is? A lesson “in” and “out” of time. Real and not real. A lesson! So there was a Christ and He showed the way. Christ is “within”. You are to be Christlike to begin with and you are “to go the way.” Then, become The Christ under the name of Reunion/Unity/Oneness. This means that THERE IS NO OTHER!!! Therefore, you can not think of the Christ Principle (Ethic) or Being as outside of your SELF. A reflection, a meditation, a game, a puzzle, an unknown “something” in the MIND OF GOD. You are here and to do the best that you are able to do to dissolve the separation and return through resolution to SOURCE. THE ONE TRUE SELF IS THE ONE TRUE SELF OF ALL. THAT IS ONE AND ONE ONLY. YOU ARE THE PROPHET, THE MESSIAH, GOD IN POTENTIAL - AND IT IS REAL. STOP PUTTING IT OUTSIDE OF YOURSELF. GET REAL! The only One who you really know now, is who you are now. That Being is the responsible one to do REUNION IN THIS LIFETIME. Putting it off and saying you can’t do it is affirming negation. Certainly if you say; “NO”, it will not happen and you are negating your own value. BY ONE TRANS-MAN’S CONSCIOUSNESS RISEN ON THE PLANES NOW...THE HIGHEST DREAMS OF MANKIND CAN BE REALIZED. IT IS DOABLE. YOU CAN DO IT! WHO ARE YOU WHEN THOSE ARE YOUR QUALITIES? CORE! DEEP WITHIN OUR VERY BEING IS A LIGHT OF WISDOM AND UNDERSTANDING. This inner essence is not strange to us, just skipped over too often and then forgotten. It is there however, whether we know or not, and there it waits to enrich your very self when you awaken and behold it with eyes to see your SELF. Then, with ears to hear, listen to this inner SELF and learn WHO YOU ARE. Yes, through work and desire, you may become WHO YOU ARE TRULY. How to get inside your inner SELF? Good question. A quest it is that you are on at that point. A quest to find the GRAIL. The Chalice which is non other than, again, yourself. Well, too many people have no idea whatsoever that there is a Higher Persona that they can inhabit. They go on focused on trivia and details of every day life, which are important as an exercise to learn how to “work”, when they could be processing themselves into this Higher Persona - a centered Being of Balance. The World is there for you to learn. The Story of the Bible and other fine meditated works are lessons in living, loving and transformation . “The story of Christ is your own to go in on - your tangent. But know, that it is another way (your way) to do and be THE CHRIST. History is your lesson. The symbols of the Hermetic philosophy including The Tree Of life, The planes, the ladder of metals, astrology, music, math, alchemy, divination, prayer, readings, writings, meditations are all there and available for and to you to learn WHO YOU ARE and BECOME WHO YOU TRULY ARE. First, you have to have revelation, recognize it and elect to go forth toward wisdom, understanding and putting TRUTH into your life by living and doing what you believe to be RIGHT IN YOUR HEART! This is called THE GREAT WORK OF TRANSFORMATION. That means that you have to go for balance in your life and get off the poles of extremities. This can be done by investigating the meaning of all experiences in your life. You can bring yourself to the point where you understand that you represent MANKIND. Then as MAN, you put your discoveries of the TRUTH of the matter and the experiences of life, even more, into your living to change what is , into what you deem right in your heart! As you do this you explore your inner regions quietly listening for a communicative voice of learning that is inside you. It is a quiet voice and comes like “mental impressions”. You must learn to hear it and trust it and allow it to get stronger as you care to balance out and receive from the so-called above which is actually ‘WITHIN” / AT THE CORE OF YOUR BEING. THE GOD IS WITHIN. AT CORE IS SO-CALLED “ABOVE”! Right where you are is the Core of the Universal - I AM. Like a miner, dig and discover. As MANKIND, work and become ALL THERE IS. Try making a covenant with this statement, then trust your Higher Self to pattern your life for you as you try to do the best that you are able to do in each and every situation that you determine is right for your life and therefore for all Mankind. Keep tuned into your inner sensorium as you try to intuit or listen for the “next step” in your life. Then begin to live that truth that has come revealed to you in this manner. You may at that point be helping others and healing and saving lives actively... or in the inner sanctum, the upper room, you may be doing the same and more in effect by sitting ex-cathedra in your chair and meditating out the PRINCIPLES OF TRUTH OF THE ENTIRE UNIVERSE while doing so literally puts them into effect (and much faster than if this meditation had not been done). Master yourself and learn the Laws and Secrets of the Universe through teachings, readings, exchange of philosophy, communication with people, experiences... but without meditating on the PRINCIPLES OF TRUTH AS REVEALED TO YOU THROUGH YOUR OWN EFFORTS INTO THE SUBLIME, YOU WILL NOT ADVANCE (RISE) ON THE PLANES OF CONSCIOUSNESS OF THE TREE OF LIFE. Keter The crown of The Tree of Life is at the top. It is the I AM. In the body, it is just above the crown of your head. It is above so-called Creation, it is above the Sphere of the Sun. It is the rainbow promise that will be for filled when any One man makes it to that level of consciousness. Therefore “He shall not go out any more.” Glory is beyond our conception and life at that point is Glory. It is deliverance and is called Freedom. When you do it for yourself, you do it for ALL. Now that’s a good deed. When the threshold appears you may(?) have more than one choice of what type of Mastery you are ready for. Do you think that you have more than one chance to step over that threshold if you say “no” through fearfulness? What is Heaven? Certainly not a glorified version of life on Earth. Can you think beyond old concepts of limitation? What is Hell? Have you had your share down here? Are you ready to be causal and know what you are doing? Remember it takes tons of pressure and “time” to turn a lump of coal into a diamond. Know also that many trials and tribulations can be dealt with in meditation which can change you and the course of your life. Meditation is Communion with the Higher Self. Reach in and up and listen. Some ONE is always there waiting for your recognition in this special way. ONE and ONE ONLY IS THERE. IN FULL POTENTIAL THEN...WHO ARE YOU? The GOD is within and you are the Servant, Teacher, Prophet and ultimately your HIGHEST SELF. There is only one HIGHEST SELF of ALL. ULTIMATELY, “WHO” IS BECOMING SAVIOR, MESSIAH, GOD - WHEN THE GREATEST “ONE POINTED DESIRE “ OF TRANSCENDENTAL MAN IS TO RETURN WITH CONSCIOUSNESS TO SOURCE? HAVE YOU RECOGNIZED THIS? Your Heart Center will whirl and tell you what is “Right”. You, however should give much consideration before you define rightness for “another”. Who dares to determine “an others” beliefs for them? Who can interpret LAW for anyone “else”? How can one follow LAW unerringly and still be “partner” in a true democracy? There are, in this Universe, dualities of Laws due to the various planes of consciousness one is predominantly functioning on. This can confuse because two different Laws can be applicable and not applicable - both. It is important to realize that on each plane you commune, work, live on - one is subject to the Laws of that plane and those above it, while causal of all below. That is true whether one is aware of this or not. Also in spite of this information, the questions above must be considered very carefully in view of where you are and where you desire to be! Who you are. Who you desire to be! Man is Gods Creation...In the MIND THAT IS! What Man creates is another story. So much. So right, so wrong (off the mark.) Why does he , man, blame it on that which seems to be outside of himself? Perhaps because it is so hard to know the truth of the matter and track all the pieces of the picture puzzle that configure “life” as we recognize it. Certainly if he is not processed to that point of realization, he won’t be able to do this yet. Nevertheless, man is responsible for his life and circumstances to the best that he is able at any moment in so-called time..sort of the “what you do with what you got” theory. We just have to learn to understand “There is no other”, All is ONE, and the responsibility can not be shifted “elsewhere”! Life is a lesson in transcendence. History points to different paths, ways and means to travel. Pick the life and sayings of a Master like Jesus to help learn what your responsibility to the SELF is. He showed and cleared the WAY but you have the responsibility to do it now. To go furthest and redeem Earth completely. At a certain point in the transcendence processing, one becomes causal (“magical”.) Magical coincidences proceed out of the Identity of this persona. White High Magic is done through and for you as Mankind. You do not have to “do” Earth magic or Dark magic to achieve higher purposes. Earth foundations the transcendental Man with support configurations of circumstances. Yes, even to the degree of physical changes in body, environment, milieu, mind sets, and more, much more. (Also, you do not demand or command. You pray or meditate or focus - for while in a state of balance, you may plan a vision of improvement (a vision which may or may not be the “result”) for you basically give up your thinking process to the Higher Mind to do it to, through and for you - for what is “right” for all lives. Then you trust and wait during which time, in your everyday life, you take what steps you have meditated out as “right” to do. Do nothing that has not been meditated out from a centered place. Do remember that this is not you doing this wonderful work. You have become a willing receptor for the Higher Will. Again, it is being done through and for you as Mankind. Receptivity is very powerful. Kabbalah means “receptivity”. *The WHIRLINGS* Round and round I go and where I land no body knows. WHO knows? Who is the lesson? Who is the “initiate” meant to learn? When are “we” lessons for each other? Who is “real” and potentially Immortal and who comes and who goes as learning takes place? How can one be so cold as not to shiver with the thought of dispensability? Yet,most agree that death is imminent. Is it? Yes, there is death of one kind or another. Mortal death or Mastery wherein the Golden Body of Involution is eventually given up. This, only after full purpose has been served and then for an eternity, infinity of consciousness. That is not as you/I/one are now or even as you/I/one are becoming, but as I AM when I AM MY SELF. It is very complicated and human minds can not comprehend as does THE GREAT MIND. A four dimensional puzzle where the picture is not set but changes, interacts while relationships still occur on the lower planes of existence. Who you are and what you do and your elections and those of perceived “others” make the game exciting or boring or peaceful or dangerous. One can be but one may not always be in full control due to limitation in “growth”/”height” and the mysterious conditions of Temperance (testing) which even (especially the best) of trans-man goes through. Identity, perspective, balanced placement are extremely important in any ones development. Getting rid of the tail of the kite (memories of personality vs Beingness of a High Persona Identity) is a whole process of the recollection of the particularities of ones life brought to Universal Truth Principles. And thus clearing the decks of baggage toward being on the way to the revelation of THE MEMORY OF PERFECTION... that is, with THE GRACE OF GOD. GOD, THE ALL KNOWING, ALL PRESENT, ALL POWERFUL ONE BEINGNESS THAT IS. ***By any name - Living Energy, Mind, Spirit, All, No- Thing, Ruarch ... by any name... ONE! IF YOU CAN NOT GIVE WHOLE HEARTEDLY, DON’T! Also examine your own life and experiences to see what could have affected your attitude toward what is happening and what seems to be really needed in the way of “service.” Are you being judgmental? Are you feeling that you have limited resources and must favor saving them? Do you feel put upon, used - fulfilling someone else's’ definition of what you should be doing? Or are you just showing others how “good” you are? All must be objectively examined by yourself. You must know yourself well. Always try to bring the particulars of life experiences to The Truth Principles of the Universe for meditation and healing. Don’t be afraid to dig, the stakes are high. The full heart must be involved for an action to be called True Service”. Strangely, whatever small deed, action (even the most tedious) that you undertake to do with this full heart may very well benefit you with now unknown useful skill(s) for some processing mystical moments still to come in your development forward, in and up the mountain that you climb as the SEEKER OF THE HOLY GRAIL. Say, even washing windows or scrubbing floors may be the developing of the wing muscles of your own Angelic Prescience! And we are not even approaching the possible potentiality of Spiritual development through True Service! *Please, you can’t do it for reward. You can’t do it because you know this information being given out here. You can only give and thus receive from your own giving, by “”serving” with a Full, True Heart.